Our goal is to obtain the compensation that individuals and their families deserve. Our firm is dedicated to helping people who are disabled or injured in automobile or work related accidents. There are no attorney fees or expenses unless we win your case. The Law Offices of Steinhardt, Siskind and Lieberman, LLC consist of dedicated Maryland workers compensation & social security disability lawyers whose goal is to help the disabled. Whether you are injured at work or in a car accident, need to apply for or appeal your social security or long term disability claim, Steinhardt, Siskind and Lieberman offer you a free initial consultation. There are no attorney fees or expenses unless we win your case. There are a lot of companies and law firms advertising in Maryland offering their services to assist you in obtaining Social Security or Long Term Disability benefits. However, many of these companies are national firms without any established presence in the state. The Maryland social security & long term disability lawyers at Steinhardt, Siskind and Lieberman, LLC have been practicing here for decades. When you hire an out-of-state company or law firm, you may meet your lawyer for the very first time when you show up for your hearing. 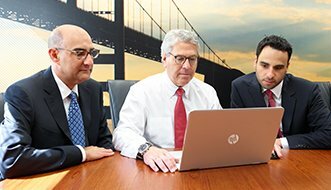 At Steinhardt, Siskind and Lieberman, LLC, you will meet us and get to know us and our staff, and we will get to know you. We know no better way to prepare the strongest case on your behalf and get you the exact benefits you need. If you are injured at work, you may be entitled to benefits under the Maryland State Workers’ Compensation Law. These include payments for time off from work, medical expenses, vocational rehabilitation, and permanent disability benefits. At Steinhardt, Siskind and Lieberman, we will aggressively pursue your claim to get the benefits that are due to you. If you are a public safety employee, such as a police officer, firefighter, paramedic, or an employee of a county or Maryland state government, Steinhardt, Siskind and Lieberman is here to help you. Government employees have special considerations and our law firm is ready to focus on those considerations. Contact our experienced Maryland workers’ compensation lawyers today. Our whole team of Maryland Social Security Disability lawyers and staff are here to assist you. Our workers compensation lawyers possess a wealth of experience – over 80 years combined – in disability cases. Additionally, our office staff has been with us for anywhere from five years to over 20 years. We know Maryland disability law, we care about you, and we work together to get you the results you deserve. When you are injured because of the negligence of another, Maryland and general principles of justice support your right to be compensated by the negligent party for your legal damages, which may include present and future medical expenses, present and future lost income, pain and suffering, mental distress, loss of quality of life and other damages. However, the burden falls on you to prove that the other party was negligent, that their negligence caused your injuries, and that your injuries and damages are as serious as you say they are. Negligent defendants and their insurance companies may hit back hard claiming the accident was your own fault, or that you are not really seriously injured. If they can show that you were in any way at fault in causing the accident, you can be kept from recovering any compensation at all. Let us take on the insurance companies on your behalf and fight to see that you get the compensation you deserve. Our Maryland personal injury lawyer handle a wide variety of injuries, contact us today. For over 40 years, Michael D. Steinhardt has practiced law, committed to helping clients receive the best legal information and representation possible. A graduate of the University of Baltimore Law School and Georgetown University Law Center, Mr. Steinhardt concentrates in workers’ compensation, personal injury, Social Security disability, and criminal and traffic law. In his spare time, he is active in the Maryland State Bar Association and serves on the board of Bello Machre, an organization that assists individuals with disabilities.